What Are Sanctions in a Divorce Case? Sanctions during a divorce proceeding are penalties for bad behavior by a spouse or his attorney during a divorce. Sanctions can be imposed by a family law judge and are governed by state law. Sanctions, in the form of monetary damages, may be assessed if one party to a divorce acts in a manner that unreasonably delays the settlement of the case. For example, you can be compelled to pay the attorney fees of your soon-to-be ex-spouse, fined a large amount of money or denied an equitable share of the assets of the marriage. Family law courts ask the parties to cooperate to resolve divorces, especially when the couple has children. So the nature and length of a spouse's uncooperative behavior are factors in determining if sanctions are appropriate. Sanctions tend to be imposed if you or your spouse try to hide assets that must be disclosed during a divorce case, refuse to comply with an order of the court or clog up the court system with frivolous complaints or motions. In a recent New York case, an ex-wife who continued to file new claims and motions over a seven-year period and ignored court orders to stop was sanctioned and fined more than $60,000. Family law courts have a range of penalties they can impose for unacceptable conduct. Sometimes the court bases the amount of the penalty on the additional amount in attorney fees the other side incurred because of the bad behavior. Sometimes a judge punishes a spouse who hides assets by negating her customary right to a split of those assets. For example, in a California case, a woman who did not disclose winning more than $1 million in a lottery was ordered to pay the entire amount to her ex-husband, a penalty that exceeded $500,000 - the amount that would've been his community property share of the winnings had she properly disclosed the winnings during their divorce proceedings. If a court imposes sanctions on your spouse or ex-spouse, make sure you have met all of your legal obligations or you run the risk of losing the monetary penalty on appeal. For example, an appeals court in California denied a $200,000 sanction award to a spouse after finding she had not met all of her disclosure requirements in addition to having played a role in dragging out the divorce and increasing the level of hostility between the parties. If you hire an attorney to represent you, make sure his behavior doesn't result in sanctions against you. Although family law cases often become contentious and hostile, they are not supposed to be overly adversarial. All parties in a divorce, including attorneys, are expected to foster cooperation and strive to reach a settlement that protects the best interests of the children of the marriage. In a recent California case, when an attorney wrote letters stating the opposing attorney was dishonest and lacked integrity, his client was sanctioned and ordered to pay a $100,000 penalty and more than $300,000 in attorney fees. Fox & Rothchild: What Happens When an Order is Violated? Can a Court Impose Sanctions? Your divorce court will issue a divorce decree that details the terms of your divorce, including how property is to be divided between you and your spouse. Depending on your state’s laws, the court may be able to consider your spouse’s misuse of money, among other factors, when it divides your marital property. In Illinois, alimony is known as spousal maintenance and is an important tool for ensuring that former spouses can maintain their lifestyle after a divorce. In Illinois, failure to pay spousal maintenance can invoke significant penalties. Prior to pursuing a remedy through courts, it may be a good idea for an ex-spouse not receiving payment to speak to her former spouse first. Attempting to resolve the issue outside of court may save both time and expense, and result in the ex-spouse receiving her maintenance payments faster. 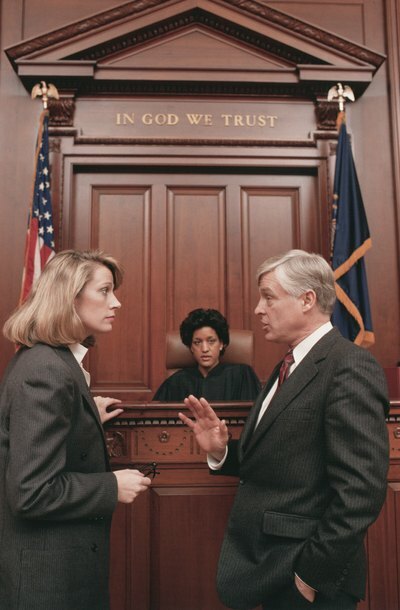 Can You Take Your Spouse to Court if You Are Still Married? What Is a Family Allowance Under Florida Probate Law? If a Party to a Divorce in California Violates a Court Order: Can They Be Held Accountable?